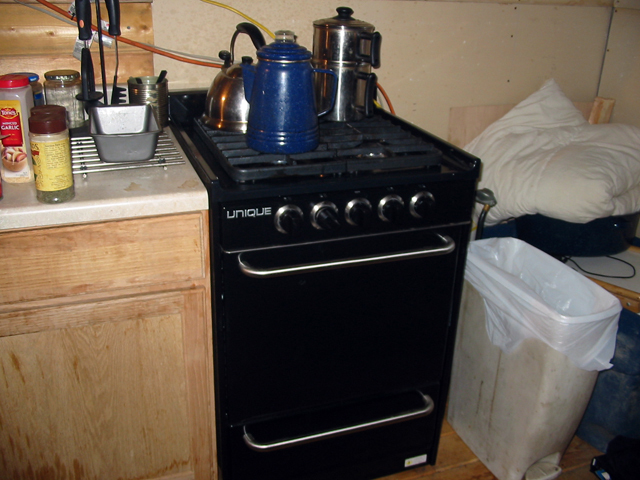 Off-Grid in Alaska: Pics of our new gas range! Pics of our new gas range! How wonderful to have a proper oven again! I mean, the nifty stovetop Perfection Oven for the woodstove was pretty sweet... but we usually ended up roasting ourselves as well as dinner. While roasting in a Dutch oven with coals works pretty well as long as it's not too frigid outside; we never quite mastered the knack of baking anything but doorstops in one. And thanks to Megan and the Amazon gift card she sent me for writing those guest articles for her blog, I've also been able to replace a few essential pieces of bakeware. Now we can easily make bread, pizza, pasta al forno and potatoes au gratin. Oh, happy day! 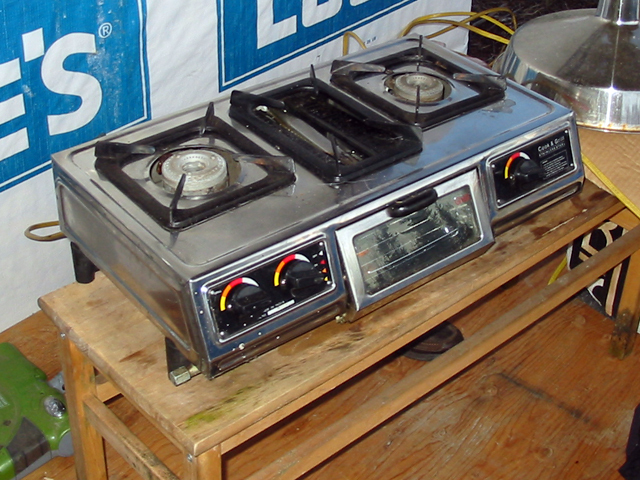 And the little portable LP catering stove that my folks got for us while we were in the tent, that has served us diligently these past couple years, can now be used indoors or out (eventually in the outdoor "summer kitchen") for rendering lard, deep frying or large-batch cooking and canning. Can't get better set than that! Hello folks, this is your followers from Texas, Jeff and Betty. We are just getting all the Alaska dust off. We are disappointed that we didn't get to see your place and visit with yall more before we had to go. The short time we did visit was great. We love the new pictures and all of the current posts (one almost every day this week). Yall make us want to stay longer next year. Hey Jeff, glad you made it back home safe and sound. It was a bummer that we had truck issues keeping us in Fairbanks longer than anticipated so we didn't make it back before ya'll had left :( Oh well, next vacation maybe!! We got snow last night. It didn't stick; but it did remind us that we better make a big push to get everything ready for winter... so it may be a few weeks before we'll be able to post again. Clearing Brush ... more PICS! Winter's Coming - landscape PICS!!! Adapter Found - finally PICS again!!! !